An Excerpt from The Joyful Life: Enjoying the Journey of Living by Tiffany Tyndall — Part of 3.1 What are some practical ways to develop joy in our lives (i.e., allow God to grow it in us)? Remember that God sees the big picture even when we don’t (i.e., trust in his timing and ways, even if you don’t understand them). For those of who base our joy on things that are outside of us, we might not ever truly experience the full kind of joy that we’re supposed to have in Jesus. Too many times, we are going through things that we don’t understand, yet we withhold joy from ourselves until we’re able to see how everything fits together. We think, Once I understand what this means, then I can relax and enjoy myself. The big reveal about joy is that God wants us to enjoy our lives even while we don’t yet fully understand what’s going on in our lives. As an extension of our faith, our ability to trust God to work things out according to his perfect timing and ways will determine the extent to which we’re able to live a joyful life. If we’re always concerned about when things are going to happen and how, then we’re never really going to be free enough to enjoy the ride, with all its twists and turns. Let us remind ourselves that God knows what he is doing, and he is always working in his best interest and in ours (and, of course, let us understand that his best interest is always our best interest). If things aren’t “happening” the way we want them to, then instead of getting all fretful about it and taking things into our own hands, we should continue to thank God for his providence and for knowing exactly what is best in our situation. Let’s keep a hands-off approach until God shows us what to do otherwise. Joy will sprout in all sorts of areas in our life when we release all to the Lord in this way. Why? Because God is the one who is in control (not us), and he’ll never let us down. If we stick with him long enough, we will eventually see that he does, in fact, come through for us every single time. Even if we find ourselves going through sickness, financial issues, work stress, relationship troubles, emotional problems, tragedy, or anything else (all things that we might assume a Christian is exempt from), let us not despair but continue to trust God to resolve everything and to work in and through our situation. After all, the “reason” (since we all like to know the reason why we go through uncomfortable, unfortunate things) why we’re going through something might just be for someone else’s sake, so that they can see a godly person respond in a godly way to ungodly events. We’ll never know how many people God is able to effectively minister to, through us, when we have this kind of outlook on misfortune when we encounter it. Trusting God through turmoil, although hard to do, keeps joy close to our heart because we know where our help comes from. We’re not confused or distraught about anything; rather, we’re confident that the Lord our God will rescue us and will bring about a good report in the end. His purposes are higher than what our minds can comprehend, so trusting that he knows what he’s doing is a sure-fire way to make our joy more concrete. 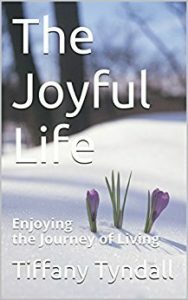 The Joyful Life: Enjoying the Journey of Living by Tiffany Tyndall is available for purchase here.